Cher Ami (translated ‘Dear friend’), was one of the most famous pigeon’s that served in the US Army Signal Corps in WWI (1918). Despite being shot through the breast, leg and blinded in one eye, she managed to fly 25 miles in 25 minutes, to deliver a message that saved the lives of the Lost Battalion of the 77th Division in the battle of Argonne (194 survivors). 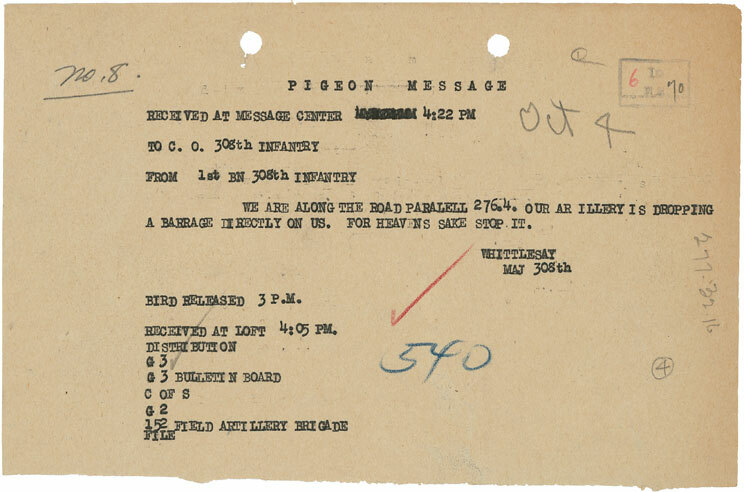 Cher Ami was awarded the Croix de Guerne medal for delivering 12 important messages from the Verdun front to Rampont, France. Pigeoneer is the term given to those that were part of the armed forces, with the responsibility of training and handling pigeons to deliver messages. As part of the US Army Signal Corps; Colonel Clifford A. Poutre, was Chief Pigeoneer of Service and Head of the Pigeon Breeding and Training centre, during WWI. 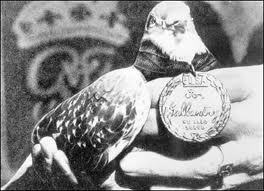 He trained pigeons, including Long John Silver and Kaiser (German pigeon captured by the US Army). This is great information for my project. Thanks. I believe I have 11 pigeon war bands given to me by my uncle during WWII. Trying to find information about them. That’s really fascinating Vinnie. You should definitely get in touch with http://www.pigeonsincombat.com or the National pigeon Association. Let me know what they say, good luck!